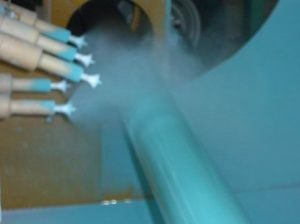 ULTIMATE SOLUTION FOR YOUR SURFACE FINISHING PROCESS PRIOR TO POWDER COATING…!! 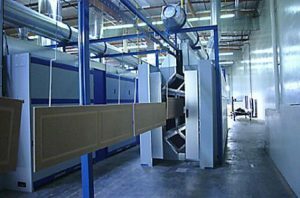 Get rid of your surface finishing worries before powder coating. 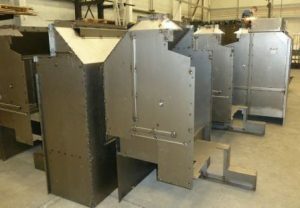 Eliminate and repair dents on the metal surface before powder coating. Conceal joints & gaps before powder coating with this advanced filler. Get seamless and absolutely fine finish with this powdercoating filler. No cracks, bubbles or color variation during oven curing process. 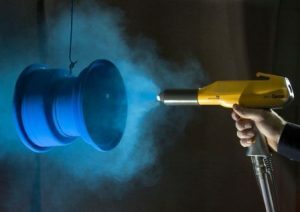 Repair any surface defects prior to powder coating , with advanced filler putty. A high temperature metal filler,repair putty for a wide variety of applications. Mechanically very strong, machinable & heat resistant. Will not corrode or, rust. It rust proofs the surface. Can be used directly from the can. PIOCOL FIXUP is a mechanically strong, heat resistant metal repair & filler putty which is easy to use and solves many problems faced by metal , aluminium casting companies and fabricators. It has a temperature resistance upto 220Centigrade. It is machinable, can be drilled, grinded, filed or, smooth finished with sanding papers and sanding tools. 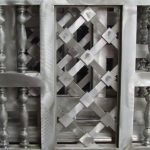 It can give a highly finished metallic appearance to the surface which can be painted , powder coated or, chrome plated. 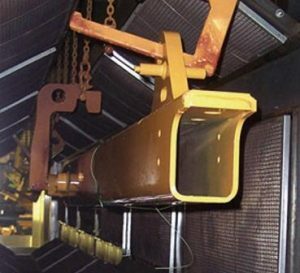 It is highly corrosion resistant. It has a very strong bonding and adhesion to all metals or, non metals. This mechanically strong repair putty can be effectively used to repair the blow holes, cracks and other surface imperfections which are visible in the fabricated structures & castings or, while they do the machining. Apply piocol Fixup Metal putty filler and patch up the surface instead of breaking and recasting. It withstands high temperature and can be powder coated or, chrome plated. Piocol Hightemp is a more advanced version of Piocol Fixup. 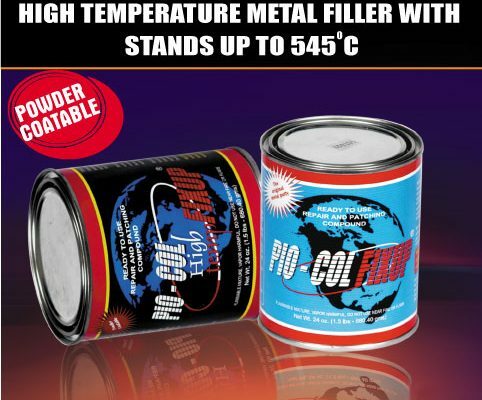 Piocol hightemp resists a temperature upto 545C. 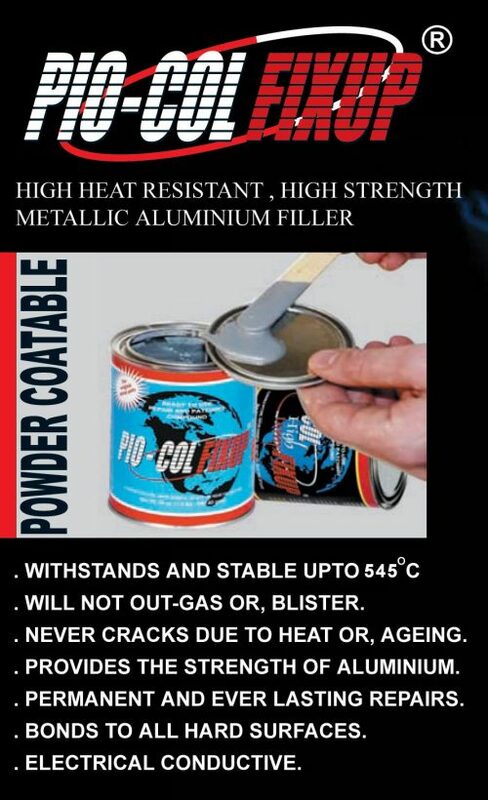 Piocol Hightemp is suitable for many industrial engineering and repair jobs which demand a higher heat resistant repair putty or, a filler material. 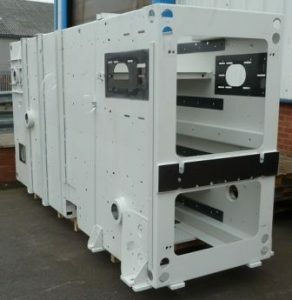 It is also recommended for powdercoating jobs which require more than one passing through the oven. Piocol Fixup fills dents and flaws in metal and nonmetal parts easily and economically. Apply Piocol Fixup right from the can with a putty knife or similar tool. No two-component mixing or measuring is necessary, therefore there is no waste. Heat, special tools and specialized skill are unnecessary. Many applications may be made from a single can. Piocol Fixup may be thinned to paint consistency with Piosolv and brushed or sprayed on practically any surface to provide a rustproof, water resistant, hard metal finish. Piocol Fixup adheres to any clean and dry metal, wood, glass, plaster, porcelain and hard plastic surface. Its strong bond withstands vibration and other difficult conditions. Piocol Fixup hardens quickly without heat, providing a durable metal surface. Durable: Once hardened, Piocol Fixup can be milled, chiseled, drilled, sawed, tapped and machined. Filing, sanding or grinding Piocol Fixup to a feather edge provides a smooth metallic repair. Piocol Fixup will not shrink, crack or peel. Not affected by mild acids, gasoline, oil or petroleum solvents. Piocol Fixup is aluminum filled, resisting attack of rust, rot and mildew. Piocol Fixup withstands temperatures as high as 220C (and as low as -40 Degree Centigrade) and when hard, can be painted with lacquer or enamel without danger of bubbling, lifting paint, chipping or peeling. Piocol Fixup stands up to normal paint baking procedures and may also be powder coated. Piocol Fixup’s metal hardness is achieved with greater ease than other materials sold for repair and finishing. Piocol Fixup sells for considerably less than epoxy systems. 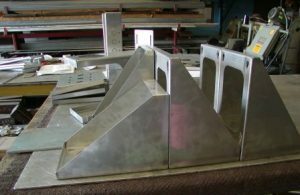 Its strength, hardness, durability and abrasion resistance surpass basic standard requirements for fillers set by the metalworking industry. Piocol Fixup is the ideal repair putty because of its extensive can life, ready-to-use formulation, versatility of applications, strength, chemical resistance and durability. Piocol Fixup cures in approximate 2-3 hours depending on the thickness of application, and atmospheric conditions. 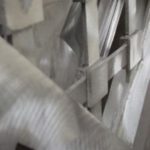 For application guidelines on surface preparation, application and finishing, please contact us, because it varies according to the nature of job. 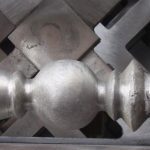 Repair blow holes, cracks and other cosmetic problems in your castings…!! Any mechanically strong metal castings can be patched up and repaired to high finish with Piocol Fixup metal repair putty. Patched surface withstands high temperature up to 220C. Get seamless and absolutely fine finish.